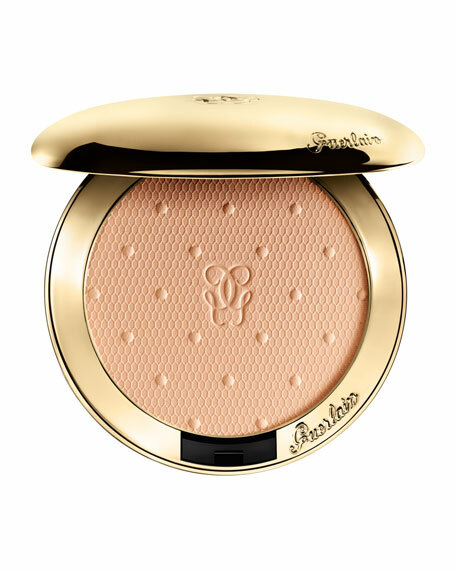 Guerlain marries incredibly fine powders and subtle pigments to create Les Voilettes Evanescent Powder. This ultra-absorbent blend sets make-up to perfection and adorns the skin in a matte veil that is imperceptible to the naked eye. Skin is left resplendent, velvety not powdery, radiant not stiff. Les Voilettes' stunning design meshes art and sophistication. A Swiss dot and lace motif is embedded into the surface of the pressed powder, ensuring the most luxurious experience from the second the compact is opened and the powder revealed. For in-store inquiries, use sku #230947.